I can think of a lot better things to spend $9.4 million on than a smartphone, but if you have more money than sense, you can now get you hands on the world’s most expensive iPhone 4S. The iPhone 4S Elite old is produced by Stuart Hughes, we have seen a few of his blinged out gadgets before on the site and this iPhone 4S will set you back £6 million which works out at around $9.4 million US dollars. The most unique mobile phone ever created with a total construction cost of £6 million. The bezel is handmade from rose with approx 500 individual flawless diamonds which total over 100ct.The rear section is formed using 24ct gold with the added touch of its 24ct gold Apple logo and 53 diamonds. The main navigation is made from gold which holds a single cut 8.6ct diamond. Also included (not shown in picture) is a rare 7.4ct single cut Flawless pink diamond which can replace the existing one. The chest is made from solid Platinum with polished pieces of original Dinosaur bone from the T-REX along with rare stones such as Opal ,Pietersite, Charoite , Rutile Quartz ,Star Sunstone. 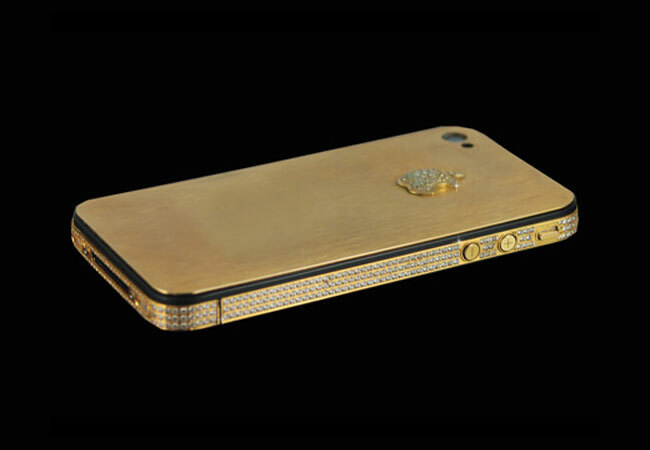 You can find out more information about the worlds most expensive iPhone 4S over at Stuart Hughes. Have a look at our article on the difference between the iPhone 4 and iPhone 4S.